Scythe is perhaps best known for its CPU coolers but the firm also has a bunch of other products including power supplies, keyboards, HDD enclosures, fans and fan controllers. 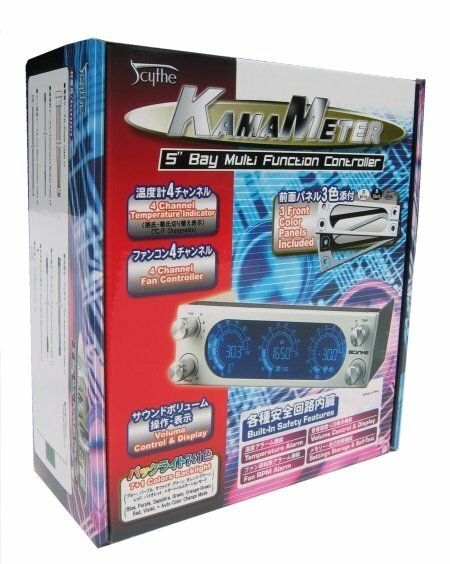 In this review I'm taking a look at the Scythe Kama Meter, which is a 5.25" multi-functional controller. The device allows you to control the speed of four fans but it also has 4 temperature sensors and even a volume control button. All this comes in a nice enclosure with a big LCD display with seven different backlight colours. Lets take a look how well this unit will score. This is the package in which the Kama Meter ships. Everything on the box is in two languages: English and I believe the other language is Japanese. Inside the box you can find the fan controller, it's housed in foam padding which has a couple of different sections for the fan controller, the cables and the face plates. Lets take a look at the specifications and features of this device. A short manual which explains you how to install the Kama Meter and a black and silver front plate. All the front plates are made out of metal, Scythe didn't use plastic for these which is definitely a good thing. From left to right: four screws, four pieces of adhesive tape to attach the thermal sensors to something in your case, four temperature sensors, four fan cables and the power cable. One of the more special things included with the Kama Meter is this PCI bracket and an external audio cable. The PCI bracket needs to be installed in your case if you want to use the volume control knob. And last but not least, the fan controller. This 5.25" device ships with three different front plates to match the colour of your case. The product ships with the white front plate preinstalled, but you can easily switch it to black or silver. To remove the front plate you need to pull off all the knobs and use your screw driver to remove the screws on the left and right side. I decided to install the black front plate as that's the colour of my NZXT Zero case. In the top left corner you can find a knob to switch between the four different fans and the knob on the top right is used to switch to one of the four temperature readings. The bottom left knob is used to adjust the fan speed and the other knob on the right is used to control the sound volume. The fan speed button also has a couple of other features. You can push it to switch between the different backlight colours and by pushing it for more than five seconds you can switch to Fahrenheit/Celsius. This is how the back of the Kama Meter looks like. The product is pretty well build, it feels quite heavy and doesn't have a flimsy feel. The installation of the Scythe Kama Meter is fairly simple and pretty similar to the installation of another 5.25" device like a DVD writer. It's best to turn of your PC first. Connect the temperature sensors and fan cables to the headers on the fan controller. Fortunately these are all labeled. If you want to use the sound volume you also need to install the bracket in your case and connect the cable to the volume control header on the controller's PCB. You also need to plug the cable from your speakers into the the "Audio OUT" connector and the external audio cable needs to be plugged into the "Audio IN" connector and into your sound card. The installation of the fan controller is now finished. I just tested it and it works fine. I connected the Noctua fan to the Kama Meter and according to the display the fan spins at about 1150RPM at max and 775RPM when I turn the knob all the way to the left. It's not really visible as it appears if the fan blades are still spinning as fast as before but when you put your ear close to the fan you can definitely hear the noise decreasing/increasing when you control the fan with the Kama Meter. The difference isn't as big as with other fans - I guess that's because the Noctua fans are designed to be quiet and don't really spin that fast at 12V. hi, i have one kama meter and is not possible control my noctua 1200 fan.